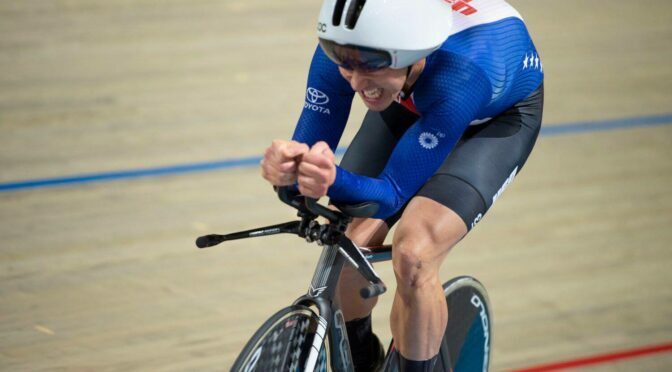 APELDOORN, THE NETHERLANDS – On 14-17 March 2019, COS Racing team member Chris Murphy competed at the 2019 Para-Cycling Track World Championships in Apeldoorn taking home two bronze medals for Team USA. Chris and his team mates also set a new US national record in the Team Sprint competition. Overall, Team USA took home seven medals. Competition took place on Apeldoorn’s 250-meter indoor wood track. Chris competed in the 1-kilometer time trial (Bronze), the individual pursuit (9th), the UCI’s new omnium race, and the team sprint competition (Bronze). Although he took home the bronze medal in the event, Murphy experienced near catastrophe in the 1-kilometer when the start gate did not release him. Chris was able to salvage bronze through a herculean effort but expressed dissatisfaction with the race organizers for not resolving persistent technical issues during the competition. According to Murphy, his most satisfying event was the team sprint on the last day of the competition in which he and teammates Joe Berenyi and Jason Kimball took bronze. The team also set a new national record in the event. It was also a breakthrough performance for a team sprint trio who has placed just off the podium in 4th place in five of their last six international races. Chris also participated in the new omnium format which added a flying 200m racing to the already challenging combination of 1K TT, 4K pursuit, and 15k scratch race. This was a fortuitous addition for Chris, who won the 200m by a convincing margin of around half a second. Chris eventually withdrew from the omnium – which was only an exhibition event in this year’s championships – to focus on the team sprint event. This year’s medals add to Chris’ already impressive tally of two golds and a bronze World Championship medals in the TT (twice gold) and pursuit. Chris also previously competed at the 2016 Paralympics in Rio, taking 4th in the world in the team sprint. Headline photo credit to @cbgphoto. Team USA vs Australia for the bronze medal in the team sprint. Chris is in the top position. Team USA on the track during the 1-kilometer race. Team USA. (2019, March 14).